Designed to familiarise delegates with the control methods used for more complex pneumatic circuits, the course aims to improve design, fault finding and maintenance techniques and skills. The course carries on from the 'Modern Industrial Pneumatics Fundamentals (P111)' course, continuing with the use of pneumatic controls. It introduces more complex control circuits and requires previous knowledge of valve operation, circuit symbols and reading diagrams. Delegates design and construct multiple actuator circuits and investigate the various methods for overcoming trapped signals. Circuit diagram layout and labelling is explored with emphasis on the need for relevant documentation. Logical fault finding procedures are introduced using motion diagrams and function charts as well as practical exercises. 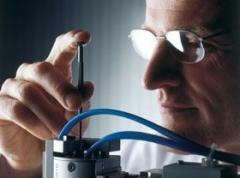 Personnel involved in the design, installation and maintenance of industrial pneumatic equipment and control systems. General engineering background and course 'Modern Industrial Pneumatics Fundamentals (P111)'. Courses take place over three days and are available in-house or at one of our training centres.